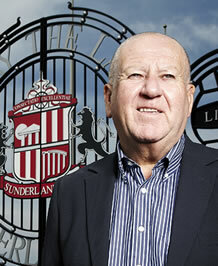 Sir Bob Murray CBE is a lifelong football fan and served as Chairman of Sunderland AFC for 20 years (1986-2006). He is Chair of Trustees of the Foundation of Light, one of the largest football charities in the UK. He also served on the Wembley Stadium Board and was Project Director for the development of St George’s Park – the national football centre for England. A successful businessman and philanthropist he took up residency in Jersey in 2003 and first met Ricky Weir in 2006 shortly after Ricky was elected president of the Jersey FA. They formed a strong friendship founded on their mutual desire to progress rep team football on the island. When Bob was approached by Ricky in January 2013 to be part of his advisory board for the newly formed J2A Foundation he had no hesitation in offering his support, not least by facilitating the donation of surplus kit from Sunderland AFC, which was distributed to some disbelieving and proud young boys and girls during Ricky’s recent trip to Nairobi in November 2014.